Ocicat kittens for sale, Jumpnspots Ocicat Kittens for Sale Thousand Oaks, CA What is an Ocicat? How did the Ocicat come to be? Here are the breeds that were used to create todays Ocicats. The American Shorthair, the Abysinnian and the Siamese were bred over the last 50 years to bring us todays Ocicats. The Ocicat is beautiful to look at with its wild-appearing spots. However, the most winning thing about the Ocicat is its personality. No wild animal was used to develop the Ocicat. It is entirely domestic in breeding. In fact, the foundation of the Ocicat, the Abyssinian and Siamese, are two breeds that have been domesticated for thousands of years. The Ocicat is consequently bred to be a companion. They are playful, affectionate, and generally social with everyone, including dogs and gentle children. As pets, they blend well into most households. However, they do require a certain amount of attention, so do best in households where everyone doesn't work long hours or travel often. If you are gone a lot, a companion for your cat, such as a second Ocicat is recommended. The Ocicat is one of the largest shorthaired breeds in The Cat Fanciers' Association, Inc. Males may be as large as 15-16 pounds at a good weight. However, not all Ocicats will become this large, the breed is bred to be medium to large in size. An Ocicat is easily trained. They are intelligent, and learn quickly. Ocicats learn their name readily, but also have learned to walk on a leash, sit up or beg, and even run agility trials. Ocicats are successful show cats too. The breed generally has several cats that earn The Cat Fanciers' Association, Inc. Regional (top 25 in a CFA region) or National (top 25 around the world) wins, as well as many others that become Grand Champions, or defeat 200 cats. The Ocicat is a breed developed by accident. 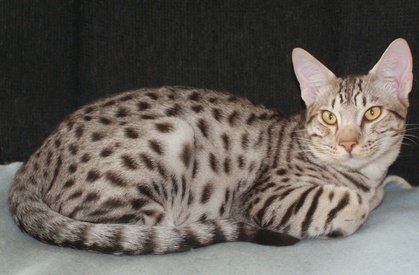 The creator of the Ocicat, Virginia Daly of Dalai Cattery, was seeking to develop an Abyssinian or ticked tabby pointed cat. 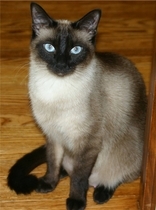 She achieved her goal, helping to create and popularize the Colorpoint Shorthair, the designer colored Siamese. But she also had a spotted kitten in one of her litters, which her daughter dubbed an "Ocicat" because of its spots. 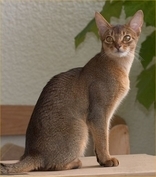 The formula of Abyssinian to Siamese was repeated to create a diverse genetic foundation for the Ocicat. Because of an bookkeeping error by CFA, the American Shorthair was also briefly used to add the silver color and a bit more substantiality. There are twelve colors of Ocicats, including tawny (named for the background, so a gold color with black spots), ebony silver, chocolate, chocolate silver, cinnamon, cinnamon silver, blue, blue silver, lavender, lavender silver, fawn and fawn silver.